HOUSTON – The Animal Legal Defense Fund filed a motion asking a Harris County judge to dismiss a baseless lawsuit filed by Landry’s Inc. and the Downtown Aquarium Inc. that claims the animal protection organization defamed Landry’s restaurant simply by publicly commenting on the long-controversial mistreatment of four white tigers, Nero, Marina, Coral and Reef. The tigers—who have never had adequate access to sunlight, fresh air or natural surfaces—have been housed indoors at the Downtown Aquarium and restaurant for 12 years. The Animal Legal Defense Fund announced its concerns about the four tigers in September when it delivered a 60-day notice of intent to sue—as required by the federal Endangered Species Act (ESA)—on behalf of Cheryl Conley, a Montgomery County woman who says she witnessed violations of the ESA at the downtown facility. Before the 60-day-notice period expired, Landry’s pre-empted the organization and Ms. Conley by suing for defamation. AZA lawyer Adam Milasincic argues that Landry’s and its CEO and owner Tilman Fertitta, star of a reality TV show “Billion Dollar Buyer,” are public figures which makes discussions of the tigers’ confinement a public concern even beyond the concern about the tigers’ welfare. “This suit’s intention is to dissuade animal advocates from starting a public dialogue about the care and environment these tigers are entitled to under federal law— including the protected right to thrive ,” says Mr. Milasincic. The lawsuit is Landry’s, Inc. and the Downtown Aquarium, Inc. v. Animal Legal Defense Fund et al. No. 2016-79698 in Harris County’s 334th District Court. Ahmad, Zavitsanos, Anaipakos, Alavi & Mensing P.C., or AZA, is a Houston-based law firm that is home to true courtroom lawyers with a formidable track record in complex commercial litigation, including energy, intellectual property, and business dispute cases. 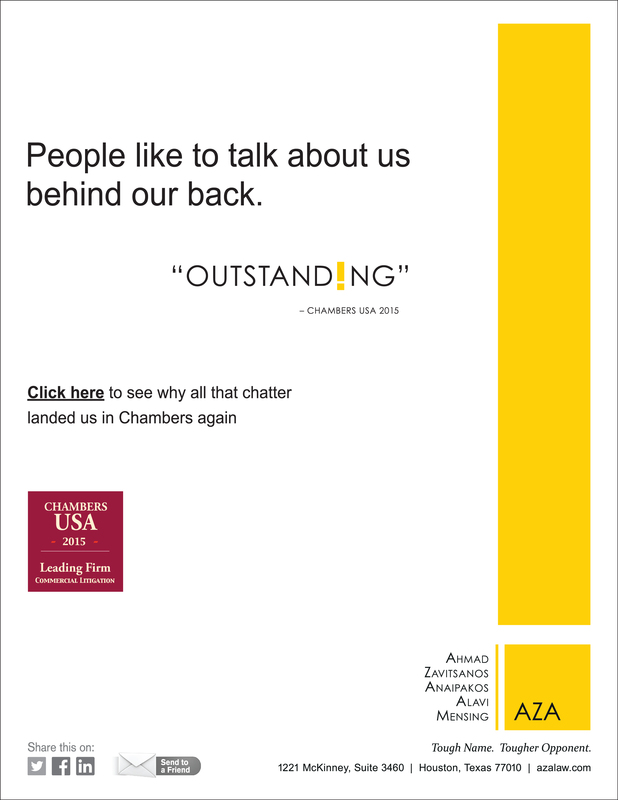 AZA is recognized in Chambers USA 2016 among the best in Texas commercial law; U.S. News & World Report and The Best Lawyers in America as one of the country’s best commercial litigation firms for 2017; and Law360 as one of only 13 Texas Powerhouse law firms. National corporate counsel named AZA one of the country’s best in client service among law firms serving the Fortune 1000.